What if the only role of social media were to drive conversation? Then it would sound like you're going every day to your psychotherapist and unveil him your conscious thoughts so that your unconsciousness could get out or deposit itself in a another box. 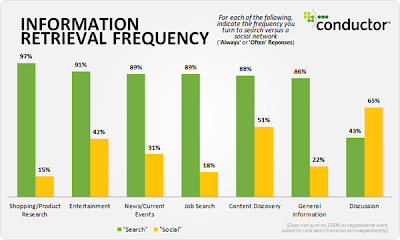 If you watch an analytic account and search for referrals you also observe that social does not drive traffic. It contains and consumes itself, as unconscious thoughts mess with your mind. You do not take decisions upon on what you are reading and interacting on your newsfeed, it only helps you deposit and include information for further discussions or cognition processes. Brands should take social media as an opportunity for listening and driving conversation, just like a psychologist listens to his patient. Consider also that a patient can get cured and would no longer need the brand. Then the conversation changes.